Zoom in a bit, in a bit more, more, more, out a bit, a touch more. Now focus. Slowly does it. Breath. Easy on the trigger. Look around the frame. Zoom in a bit. In a bit. In a bit. Breath. And. Wait for it. Shoot! Snap? Click? Damn it. Turn it on. Refocus. Pan right a bit. Easy on the trigger. Breath in. Breath out. Perfect. Count down from three, two… get out of the way! Three, two, one. Snap. Click. Whirr. You beauty! And so the beat goes on. Time after time after time. You’ve seen the Taj Mahal a thousand times. There are men who find employment at the Taj by walking you around the fifty or so most photographic angles. You follow them unknowingly. You take the photo. You’re pleased. You pay them. They’re not pleased. You pay them some more. Now their friends not pleased. The Taj Mahal doesn’t have a bad angle. I don’t honestly believe you can go wrong. This particular shot was taken from a rooftop restaurant and is the epitome how you should view the photographic world – with your eyes wide open. I should of shot a whole series from up there in hindsight, but my battery was waning and monkeys were gathering around my saag aloo. Man shouldn’t be made to make such decisions; get the shot, lose the food or eat the food then… wait a minute… get the shot? Hindsight is a wonderful thing. But there it is; a big fat clue, to just one unique view. Has the marvel in marble wet your appetite for a meander through North India? Worry not young ranger, you’ll find a remedy of reminders in my album of imagery from this glorious region. I felt the same way when taking pictures at the Taj – sad that I couldn’t find an ‘original’ angle, but not disappointed because…like you said the Taj Mahal just doesn’t have many bad angles. I love most pictures (including the one above) of it. Hehe – I took the exact same photo 8 years ago! I love how some bits of India never change! @ Becks: Tell me you’re joking?! 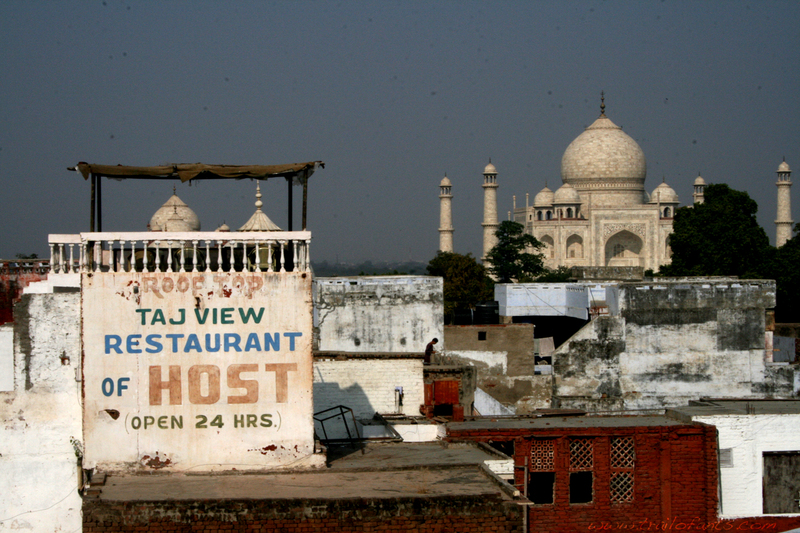 That just proves it – that one of your best friends has taken the same photo – there are no unique shots of The Taj left!